This entry was posted on December 26, 2015 at 10:09 am and is filed under Bike stuff, Cold, Gadget lust, In the neighborhood, Technology, Winter. You can follow any responses to this entry through the RSS 2.0 feed. You can leave a response, or trackback from your own site. My experience with lights is that you really do get what you pay for. And there is a big difference in lights to be seen with and lights to actually SEE with. For rechargeable, Night Rider has had a good reputation. With LED technology the size and weight of the lights are smaller for the same lumens than when I was doing 24 hour races about 10 years ago. And lights are now available that charge with a USB cable. I liked to go with a good rechargeable for brightness, but have one or two battery op lights for back ups, either on the bars or on my helmet. For nighttime trail riding running bar lights and a helmet light is the way to go. One to light up the area and one to light up where you are actually looking. But I gave up that night riding nonsense several years ago after a near broken rib experience. When my ancient, lead-acid battery Nightrider gave up the ghost a few years back the LBS guys loaned me a current version, something like a “650” whatever that means. This thing worked amazingly well! I bought the “750” model after this experience and have used it a time or two. Reasonable price, plenty of light even on the lowest setting, easy to charge via USB. I wonder what could be better? I ran it on the handlebar and was fine for off-roading in the dark to the point I wouldn’t spend extra loot on an additional helmet-mounted, though some say they won’t go out without both. I have my wife drive the jeep in front of me. Damn thing leaks like a Russian submarine, so then I just strike a match and follow the trail, mission impossible style. Thanks, MD, Larry. 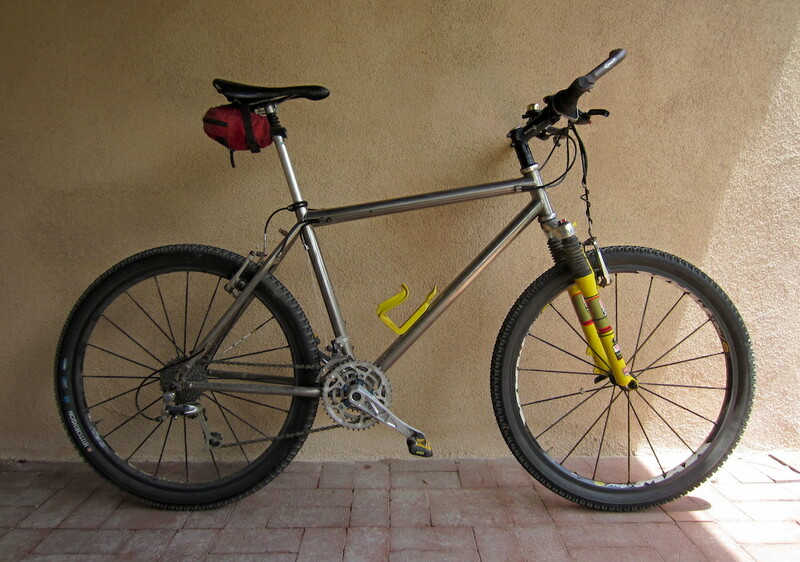 I’m not aggro’ off road even in daylight, but I think I’d like to have belt and suspenders (bar and helmet light) for the occasional moonlight ride or tour gone horribly wrong. The little Princeton Tec Remix helmet light was OK for a short outing, and suitable for trailside repairs. Steve, the wife must have a lead foot to stay in front of the flames. Maybe it’s the thought of seeing that weirdo Tom Cruise in the rear view that has her putting the pedal to the metal. When I’m not recovering from a ruptured achilles tendon, I use this light for my daily commute: https://goo.gl/ca4BF0. Best bike light ever. You can buy this bad boy on Amazon, but wanted to point you to the manufacturers site, because German. You’ve been hanging around with that shameless Krauthead Charles Pelkey again, haven’t you? I bought a Niterider Pro 1200 for commuting. Have not used it for off road. The 1200 provides a lot of light at full power on the downhill run past the golf course, where I can best 30 mph and where deer have been known to run out in the road. The rubber friction mount for the handlebars might take the bumps better than the Niterider 650 that is on my cross commuter. That mount jiggles a bit and looks like it would go flying on a good hit. My favorite helmet light, for observing fields for deer or side streets for idiots, was a 500 lumen Light and Motion HID lamp. It was very light since the battery was on a cable in my back jacket pocket so I hardly noticed it was on my helmet. But it just died and I have to send it back to see if they can fix it. Meanwhile, I piked up a Light and Motion Viz 360 on sale at REI. What I like about it is the large rear LED lamp. The front lamp is OK as an auxiliary, but at 120 lumen, you would have to be insane to depend on it alone to dodge potholes, logs, or large items on a singletrack. Its been a while since I shopped for lights, since my old ones were OK. A lot of great stuff out there and LEDs draw little power and are practically indestructible unless they fall off and you lose them. Heard good things about Light & Motion and NiteRider, K. And yeah, looks like that Vis 360 is more of a “be seen” than seeing light. But the rear LED is killer. I usually rock a saddlebag full of tubes and tools and a seatpost tail light gets blocked. I lead a Wed. night dinner ride year round. Most of our regulars order lights from http://www.dx.com or from Amazon; they are more powerful, more up-to-date, and far cheaper than LBS, Performance, etc offerings. The downside of these sources is that shipping from Hong Kong takes a month or so, don’t expect instant gratification. The DXSoul option on their website does use air shipping rather than slow boat, same price. It’s hard to suggest a particular light because the options change frequently. The state-of-the-art options change about once a year at the bike shops. They change continuously at DX & Amazon. Look for the latest generation of emitter ( i.e. the LED) from Cree or SSC. These are the 2 companies that make essentially all of the LED’s in bike lights. In headlights, I prefer to run 1 from each, a spot and a flood, both powered by 4-3.7v lithium ion rechargeable battery packs. If I had to choose only one, I’d go for a flood. Prices mostly run ~$40 to $~30 for these. 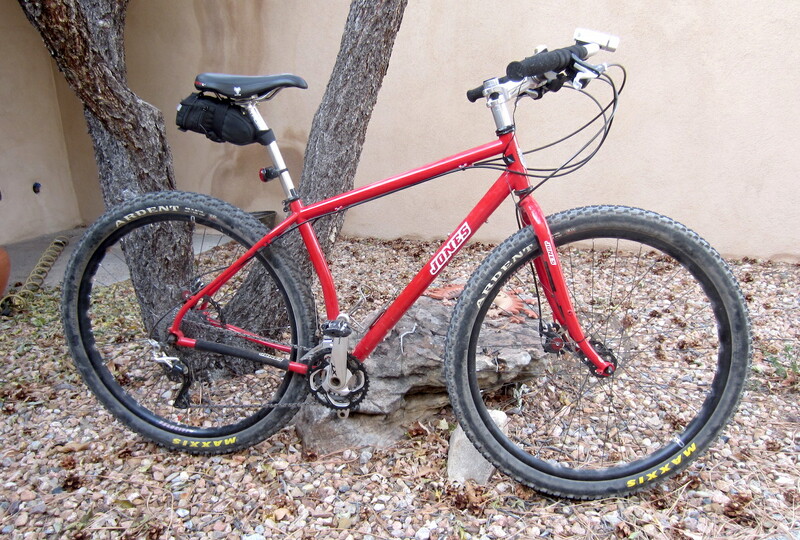 You can’t touch anything remotely comparable from a bike shop for less than $100+ more. 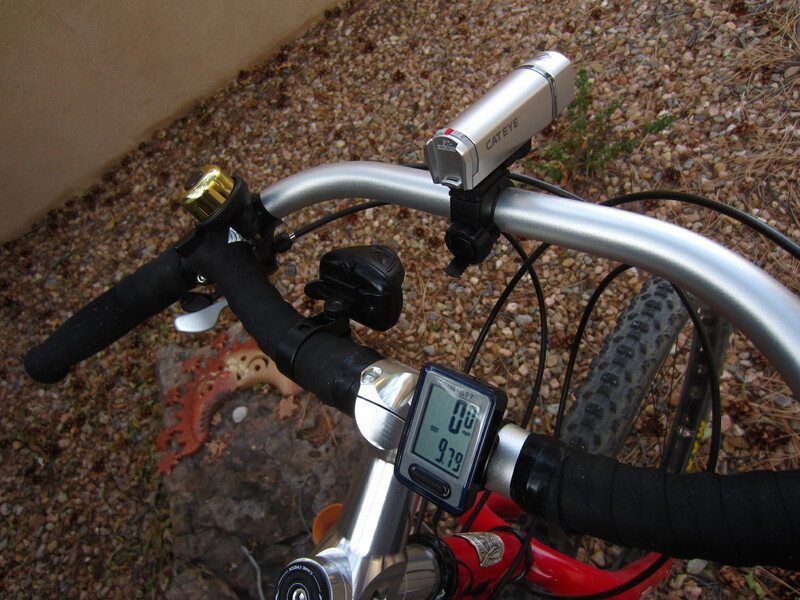 I have recently been using a $20 unit with 2 (small) XML-T6 emitters, which is fine for riding a rural bike trail at night in cold weather. I have also been running a helmet light lately, great for spotlighting who- or what- ever, confusing cars, and dealing with mechanicals. IMHO redundancy is better than carrying spare batteries. I also use 4 to 6 rear blinkies. It’s good to look like an ambulance, less chance of needing one. Thanks, Bill. I agree on redundancy, being the kind of dude whose road trips include taking two computers, two cameras, two notepads, etc. If I wanted to go shopping, I’d go shopping for something I didn’t already own two of back home, dagnab it. I don’t know squat about front lights. But, I wanted to point out that you and herself seem to attract the best neighbors in Duke City and Bibleburg. Speaking of Herself…..how is the gentler side of the PO’G Clan doing? Great I hope. Give her our best wishes. And The Mad Dod Media Menagerie are prospering as well I hope. Wonderful weather here in the Black Forest north of Bibleburg…..should only reach 0 tonight and a chill factor of -20. Stay warm and comfy all…..an advance best wishes for a safe and Happy New Year! Pat, you’re right, we have been astoundingly fortunate as regards neighbors. We have two willing dog-sitters in the cul-de-sac, one on either side of us, and the local neighborhood-watch guy is two houses away. Lots of friendly faces, which beat the other sort. JD, Herself is enjoying an extended break from her chores. Sandia shuts down for a stretch this time of year (to patch up the Death Star, I guess), and this afternoon she flew off to Las Vegas with a gal pal to have some fun. Just beat a snowstorm out of Dodge. It’s 27 at the moment, ’bout the same as it was when I went for a ride 3-ish. The Boo was not amused and pooped on the patio bricks. Turk and Mia are delighted to have a large plastic box indoors for that sort of thing. I like the Light and Motion VIS 360. Works well, bright and I like the side illumination it provides. I am partial to a helmet light, nothing says “stop” like shinning the cab of a pick-up. I also like that there is a head strap available so that I can use this light of my helmet- either running, hiking or what not. Big fan of the Night Rider Lumina 750. Good run time even on high, excellent flood like pattern with a very white light. It gets lots of (good) comments from pedestrians and motorist including an Evanston cop – “That’s one hell of a bike light.” one 3am. Generally run it on medium at night and on flash in the day time. I like USB charging lights, there’s always a charger around somewhere. On the Sutra and Mundo which have hub generators the B&M Lumotec IQ Premium Cyo with daylight running light and standlight. Not as bright as the Lumina 750, but it’s always ready to go and is bight for our low light level streets. On the Sutra I am going to pair it up with a Trout Plug 3 for touring.